What does it take to sustain a single character for 75 years? Since Batman's first appearance in May 1939, hundreds of writers, artists, and editors have applied their craft and their personalities to the Dark Knight, reinventing and rebranding him from decade to decade (in the '50s, Batman traveled to the moon to fight aliens; in the '60s, he walked down the street in broad daylight and signed autographs). Creating the Bat takes just a short peek into this never-ending process, asking five quick questions to the creators who have helped to make the Batman what he is today. 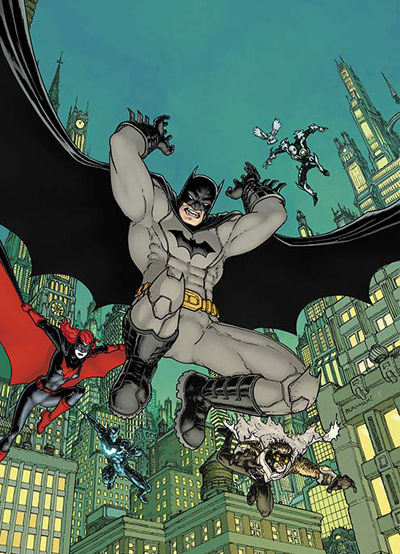 John Layman took over writing duties on Detective Comics in October 2012, just over a year after the title's relaunch. Though his has been, as of yet, a short run, his time with the character has already proven to be memorable, typically casting Batman's rogue's gallery in a new light, from the 73-year-old Penguin to the lesser-known and -used Wrath. Perhaps what is even more memorable is the path that has led Layman to such a high-profile comic. Originally an editor for Wildstorm, which is now a branch of DC Comics, Layman turned full-time writer in 2002 and has had his hand in a number of licensed properties, ranging from Marvel Zombies vs. the Army of Darkness to Godzilla: Gangsters and Goliaths to, amusingly enough, Army of Darkness/Xena: Why Not? 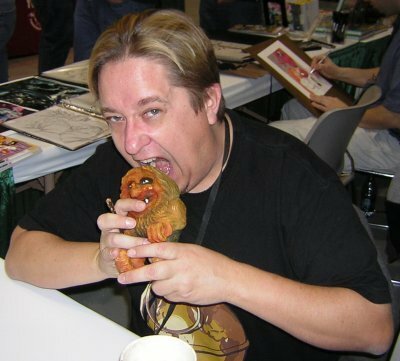 But it is in his original, creator-owned material that he has found true creative and critical success, most notably the Puffed graphic novels and the cannibalistic Chew ongoing series, which he started in 2009. Though Layman will be leaving Detective in the coming months, he'll be moving on over to the newest Bat book, Batman: Eternal, which is DC's first jab at doing a weekly Batman series. He'll be joining a number of other veteran Bat scribes in the venture, who will be overseen by Scott Snyder, the current writer of Batman and the brand-new Superman: Unchained. What fundamentally distinguishes a Batman story from any other comic? Batman is one of the few comics that is about a place as much as it is characters. And Batman is equally about Batman, and the villains who challenge him, and how life in Gotham is affected by both as a result. You've said before how the humor in your Detective Comics run came through accidentally. Can you talk a bit about the struggle of maintaining your individual voice as a writer while staying true to the character or his current, overarching storyline? I haven't really found it to be a struggle. You know going into a non-creator-owned book it's not going to have the same sort of voice as a creator-owned book. I've never given it much thought, as my primary concern has just been to tell a good Batman story. How important is it to establish or maintain a different tone for the different Bat books? And how difficult is it with so much overlapping continuity? One of the great things about Batman is how many types of stories can be told with him -- supernatural, gritty detective, conventional superheroics. I think that's one of the reasons for Batman's continuing popularity. The overlapping continuing is something to consider. I mean, with Batman in as many places at once as he is in any given month, you have to suspend a bit of disbelief. Batman is a character that is always moving and tackling a multitude of threats. As a writer, you have to address the big stuff, but the healthiest way to approach it is to not think too hard about everything that Batman is always doing. A common thread running through your story arcs thus far has been an urge to cast a different perspective on the status quo, whether that be with the villains ("Emperor Penguin") or Gotham itself ("Gothtopia"). Is this personal preference or the desire to keep Batman feeling fresh? I've always found variations on a familiar theme works well for comics, adding a twist to something that's already familiar to the reader, because it's new and yet accessible. Do you ever give any consideration to what your Bat legacy may be or how your run will otherwise be remembered? Or is that counter-productive? I hope it will be well-regarded, but I don't pay too much thought to it other than I want it to be viewed as a time of quality stories. Of course, I would say this about everything I write. I think, though, I'm very fortunate to be writing Batman when I am. I believe Scott Snyder is making history with his phenomenal run on Batman, and my run will be looked at fondly simply for being around at the same time as that. However, my ambitions are a bit humbler: I just want to tell a good story.